This project followed on from 2 previous developments at Duncan of Jordanstone College of Art. 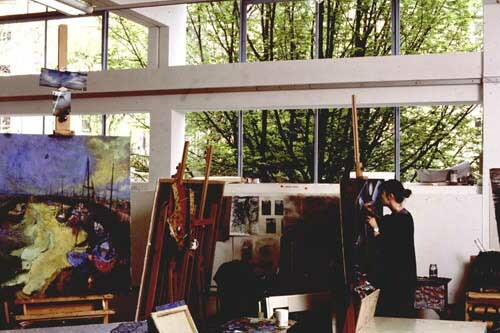 On this occasion new galleries, studios, foyer space and a glazed, feature staircase were created in the College’s totally reconfigured main hall, significantly rationalising circulation within this wing. Constructed over a 24-week programme, major elements of the project were completed during the University’s summer recess, with the remaining elements managed to permit the continuing operation of surrounding activities and rooms. Studio spaces can be transformed to double function as gallery and display spaces during degree show exhibitions, while the stair itself is conceived as a playful and flowing “carpet” – an architectural event around which students and staff can both congregate and orientate.